Manage all your electronic accessories in one bag without any difficulty, easy carrying and suit for your backpack or suitcase, a good bag makes your trip more convenient! This is a universal electronic case which will help you to organizer many digital accessories, keep all the thing in one bag! fashion vivid color with black zippers, suit for all the occasions! Dimension: approx L 11" * W 7.9"* H 1.4"
HIGH QUALITY & UNIQUE MATERIAL: this electronics organizer bag is made of double layers hard-wearing oxford fabric with PE cotton inside, durable and eco-friendly, keep all kinds of your digital accessories well organized. Dimension: approx 11.0"(L)*7.9"(W)*1.4"(H) /28*21*5 cm. Weight: approx 8.8 ounces/ 0.25kg. EXCELLENT PROTECTION: well-padded semi flexible covers with PE cotton, give a good effect of buffering and waterproof, will keep your electronic accessories, your cables, flash disk, USB drive, power bank, headphone etc very safe, even the small part accessories can be protect very well. 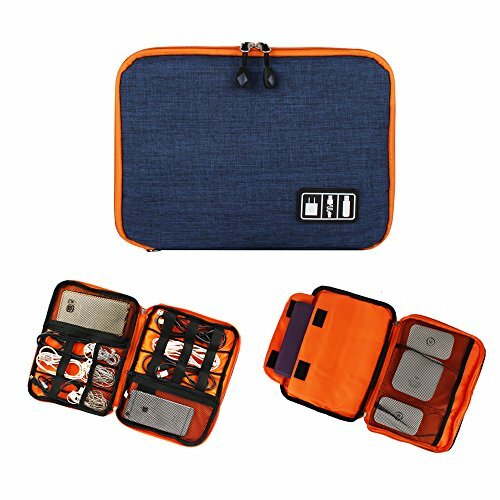 2 LAYERS LARGE CAPACITY: contains 2 mesh pockets for chargers/cellphones, 12 elastic loops for cables, 3 mesh small pockets for USB flashdisk , 1 SD/TF card storage pocket, 2 mesh pouch and 1 big adhesive pouch for iPad mini/kindle. PLEASE NOTE this organizer bag fits for iPad Mini but NOT enough for iPad Air & Microsoft Surface. MULTIFUNCTION: this electronic storage bag is very useful in travel or daily using, easy to carry or to put in your briefcase, luggage and backpack, portable and space-saving. Besides it can also serve as universal travel case, desk cords organizer, small gadget bag, cosmetic organizer, jewelry organizer, pencil storage bag etc. 100% RISK FREE PURCHASE: if you have any questions about our electronics organizer, please don't hesitate to return it to us, we are gonna to change a new one for you or 100% money back guarantee. If you have any questions about this product by Softcloudy, contact us by completing and submitting the form below. If you are looking for a specif part number, please include it with your message.